Okay! 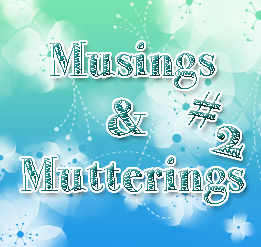 Musume Time: Musing & Mutterings: Episode 2 and Away! My second episode of my Podcast is now up, and this week the focus is more on writing than anything, though I also talk about my first week back home from University and some Idol stuff as well, however writing is the main focus this week, as I wanted to talk about strongly for this podcast. I talk about the forms I write in, writing about Idols and what inspired me to start writing for the first time ever. Yeah. WRITING! I think I became more confident in this Podcast, that said, it could be because I'm really tired (have not slept since yesterday, basically, because I couldn't sleep in my boiler of a bedroom!) and typically when tired, I am hyperactive. Once again, I just talk and mutter and ramble here! YAY! Hear the Rambling on Writing and Idols and Family HERE!!! Anyway, I will leave you with the podcast. I hope that you enjoy my random mumblings, and I hope that you all have a wonderful week! For now though, I am ready for a nap. I kind of need it!